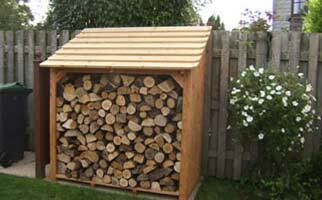 We offer a design service to create a log store for you that fits the space you want in the style that suits your setting. There is a range of styles for you to choose from. 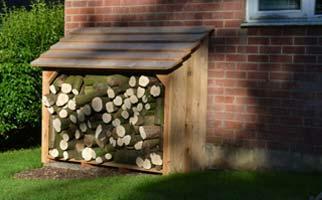 Style A log stores with a forward sloping roof. 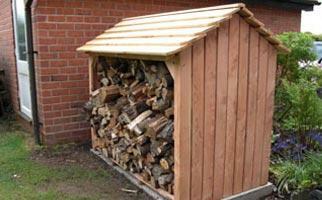 Style B log stores with a backward sloping roof, particularly suitable where height is limited. 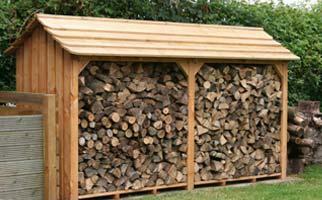 Style C log stores are larger with a double-pitched roof. 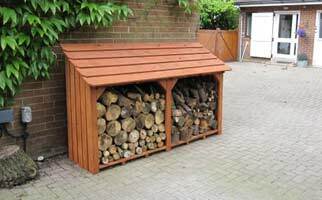 Style S log store has a roof with its ridge running from front to back roof like a sentry box. 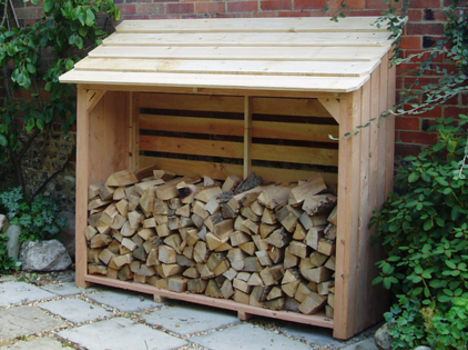 We offer a design and build service to create a store for you that will incorporate wheelie bins, recycling boxes and, if necessary, log storage as well. 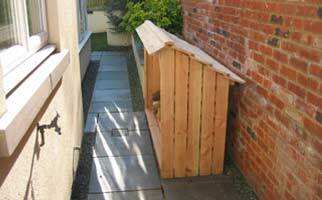 We can build an elegant solution for you to hide those inelegant bins but still offer easy filling, handing and removal. 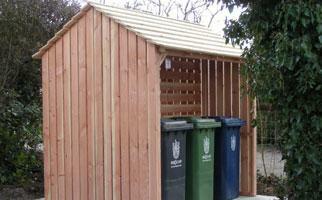 Each local authority seems to have a different arrangement for collecting waste and recycled material. We can create a storage unit for the number and size of wheelie bins and recycling boxes to accommodate the particular requirements of your area. There are two styles for you to choose from. 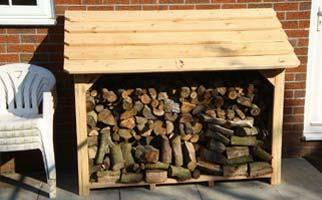 Style W bin store with an adjacent cupboard for recycling boxes and optionally a log store to the side. This has a backward sloping roof and easy access from the front. 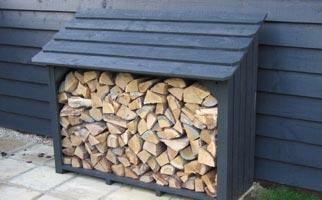 Style X bin store (which is larger) with bins stored back-to-back with logs on the other side. 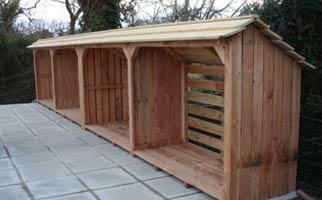 This is a large unit with a double pitch roof. If you do not see exactly what you are looking for, please give us a call on 01691 648016 and we will try to design a store to suit you. 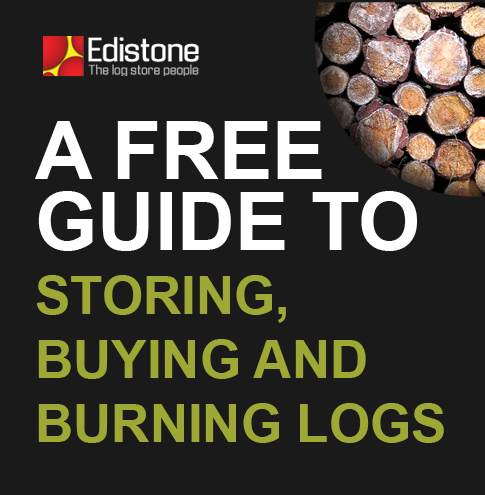 Stores from us do not need treating: more information is on our about log stores page. 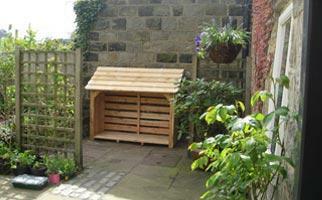 Some customers choose to stain them themselves, to match their landscape or garden setting. 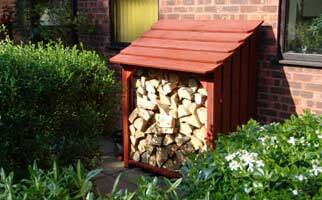 The lead time for a made-to measure log store or a wheelie bin store is currently between two to four weeks, depending on the style. 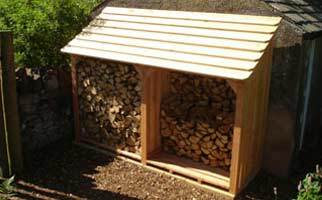 Demand is quieter at this time of year, so beat the rush and get your store bilt now. 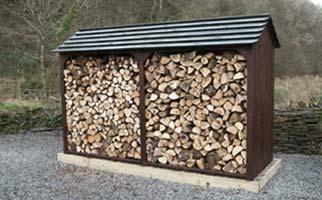 Our stores are made from timber we have grown in our forest in Mid-Wales close to Lake Vyrnwy. 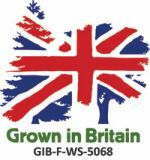 This woodland has been certified by Grown in Britain (GIB-F-WS-5068) as responsibly managed and our products carry the Grown in Britain label. 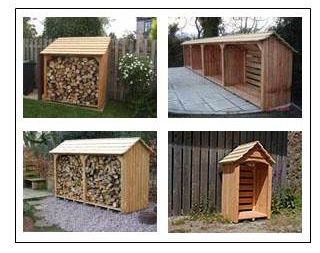 The pictures of made-to-measure log stores and wheelie bin stores shown on the pages on this site are examples of commissions from customers. If you would like to see the stunning area where we are based - with its mountains, deep valleys and lakes, you might like to stay in our five star spacious holiday cottage and enjoy the peace and tranquillity of this stunning area. We are very grateful to all the many customers who have kindly provided many of the photographs used on this site.